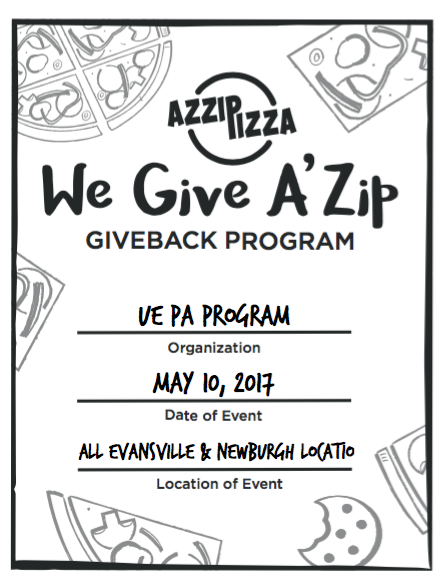 PA program fundraiser at Azzip Pizza is today! Join us in raising money for the PA class of 2019 by dining at any Azzip Pizza location today. Bring in this flyer and 20 percent of your purchase will be donated back to the PA class! Sign up now for your wellness screening and earn HRA credits. Screenings will be held in the UE Employee Health Clinic on June 6, June 7, and June 8 from 7:00-10:50 a.m. Sign-up on Acelink. A 12-hour fast is recommended. E-mail ac357@evansville.edu with questions. Indiana State Board of Education will host a board meeting in Eykamp Hall, Ridgway University Center, on Wednesday, May 10 from 9:00 a.m.–4:00 p.m. Please contact Kari Hughes at kh355@evansville.edu with any questions. Evansville Day School will host its Performing Arts Night in Shanklin Theatre from 7:00-9:00 p.m. on Tuesday, May 9. Please contact Kari Hughes at kh355@evansville.edu with any questions. The employees of the University of Evansville are again invited to play golf with other UE employees on Thursday afternoons during the summer months. The UE golf outings will be on Thursday afternoons at 3:00 p.m. at Fendrich golf course. You can reserve your tee time by contacting Debbie Kassenbrock in the Center for Academic Advising at dk26@evansville.edu or 488-2605 by 4:30 p.m. on the Wednesday prior to the outing. 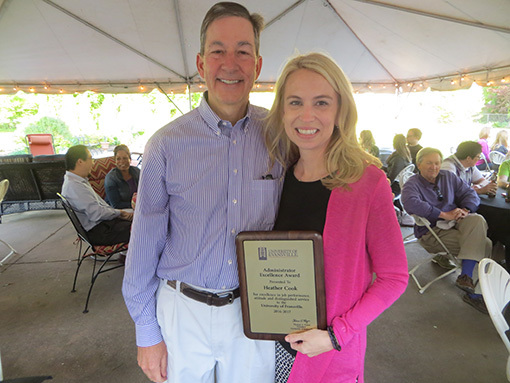 Dedication and loyalty are just two of the attributes that describe senior admission counselor Heather Cook, recipient of the 2016-17 Administrator of the Year. Those nominating Heather praise her as someone who goes above and beyond for any student that she comes in contact with, and they say her love for UE is obvious to everyone. Heather’s warm manner and friendly style provide a wonderful environment for prospective students and their families. She eagerly reaches across campus to all departments to ensure that every student here on their college search has the best visit possible. She dedicates countless hours traveling to college fairs and high schools all over the country to engage students and relay to them the many reasons that they should make UE their college choice. Heather manages all of this with a positive attitude, even during the challenging and high pressured time of enrollment. Five University of Evansville student-athletes were honored recently with one of the most prestigious Missouri Valley Conference Awards – The President’s Council Academic Excellence Award. The President's Council Academic Excellence Award requires a minimum 3.8 cumulative grade point average (through Spring 2016 semester), participation in athletics a minimum of two years, and the student-athlete must be within 18 hours of graduation. Evansville’s recipients were recognized on Saturday morning at the Senior Breakfast, which is a yearly event that recognizes all senior student-athletes on the morning of graduation. Biggs, Boswell, Dierkes, and Simmons were each in attendance while Plocek was unable to attend. Pahud finished the year with a 73.67 stroke average over the course of his 30 rounds of action. His low score of the year came in the Donald Ross Intercollegiate in the fall as he posted a 69 in the final round. He had a 3-round total of 212 strokes on his way to a tie for 7th place. His best finish in the fall was a tie for 6th at the Butler Fall Invitational. In the spring, he posted four top 12 finishes and did not finish worse than 21st in any of the six tournaments. His top outing was a tie for 3rd place in an impressive field at the Hoosier Invitational, hosted by Indiana University. The Finance major has notched a 3.4 GPA at UE. Six golfers are on the first-team unit. Carpenter, Bennett and Jacobs are joined on the first team by Dustin Atkinson of UNI; Drake Bushong of Bradley; and Pahud. Tommi Avant of Drake; Kory Franks of Missouri State; Zach Hoskins of Loyola; Zach Jewell of Bradley; Jason Marrs of Illinois State; Conrad Walcher of Wichita State; and Peyton Wilhoit of Southern Illinois received honorable mention selection, by virtue of receiving a minimum number of votes. The criteria for the MVC scholar-athlete team parallels the CoSIDA (College Sports Information Directors of America) standards for its Academic All-America® program. Nominees must have at least a 3.20 cumulative grade point average (4.0 scale), while the student-athletes must have reached sophomore athletic and academic standing at their institutions and must have participated in at least 50 percent of his team’s rounds or played at the MVC Championship.